When the weather first started getting cold, I looked up a ton of stuff on how to keep baby bundled warm. I love to exercise outside but do not want Adalyn to be cold of course. I recently discovered the Kowalli baby carrier cover which is a huge help in keeping baby warm over the winter months. This cover goes over any baby carrier. I tried it over the Boba carrier and the Solly Baby wrap which are quite different from each other and it worked great with both. As a new mom, it is easy to get totally consumed with baby care, household work, career work, etc. Something that I have made sure to keep up with that is very important to me is fitness. I exercise about 6 days per week and walking is my primary form of exercise. Since it has gotten colder, I have been walking more on the treadmill instead of outside which makes me a little stir crazy. 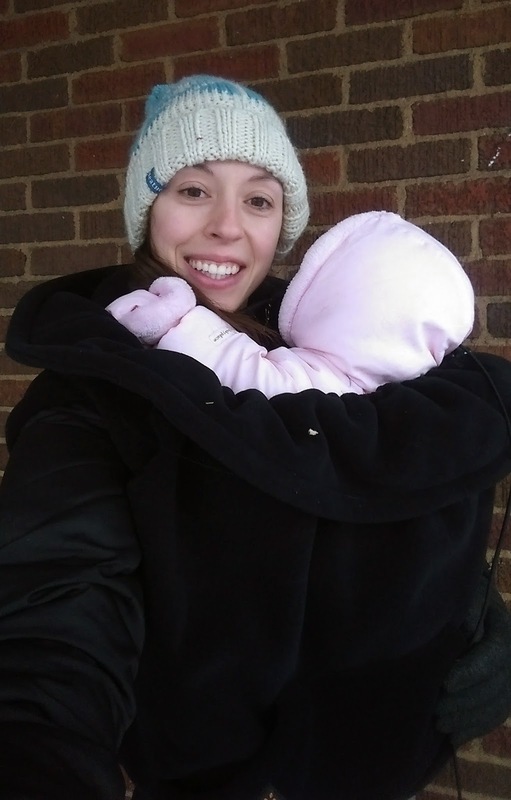 With the awesome Kowalli baby carrier cover, I can go outside with baby knowing that she is warm. I put her in a warm outfit covered by her snowsuit with hat and gloves. Then, I put her in the carrier and covered her with the Kowalli baby carrier cover. I was very happy with it. It is very simple to put on and kept us warm. I can now fit in my exercise outside with my baby. It feels great to get out of the house and get some fresh air (even though it is freezing). I walked a little over 1/2 mile to my parent's house and then felt Adalyn afterwards and she was perfectly warm. Yay! It is versatile also and baby can face front or back. It is adjustable for different sizes by the elastic cinch on the top and bottom. This carrier cover currently retails for $69.00. If I were to go back when I did my registry, I would register for more cold weather gear such as this. The giveaway will be for one Kowalli baby carrier cover to one reader.